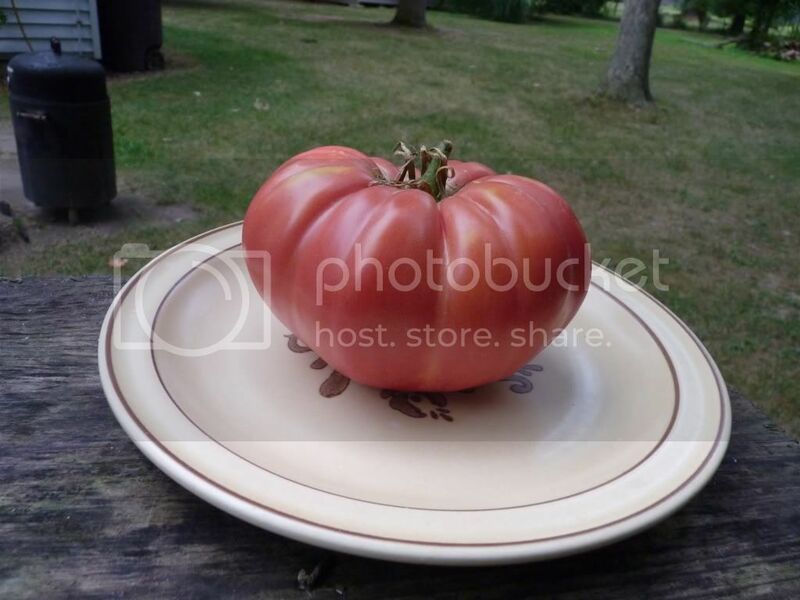 Here is the 1st big tomato of the season. It's been so dry, I'm surprised it did this well. Ah... that's a beauty. How big is it? My biggest are the brandy wine about 1 pound! They have a very good taste! Wow! that's a great looking tomato you got there. How does it taste? It was good and juicy. I saved the seeds for next year. I bet it tastes as good as it looks. Have you ever noticed during the dry season vegatables and fruit all have a much better flavor. During the wet season fruit and vegatables are all watery with less flavor. We had a month of very not dry weather 100 degrees with no rain but now that my tomatoes are getting ripe we have been having flash floods about every 6 days. My tomatoes are a little bit short on flavor. webmaster wrote: Ah... that's a beauty. How big is it? More importantly what variety is it? That's a big'un an so pretty to boot. I had my share of monsters around that size but I think you got me on this one. This is a bradywine Sudduth they all cam out about this big. 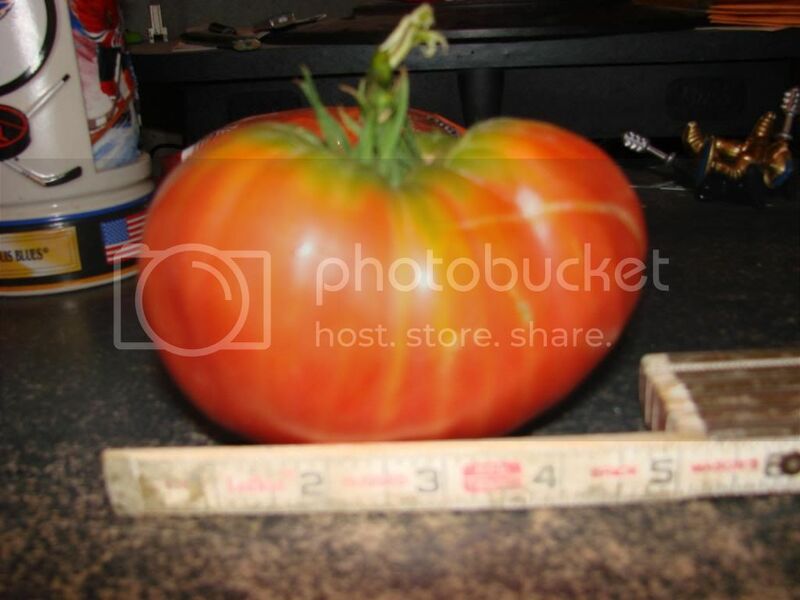 LOL, I wouldn't even think of weighing it if any of my tomato plants would produce same size of that I would just be so proud of it. I just know them as a Beefsteak. Those seeds have been our family for generations, and we plant them year after year. They get big and taste good. The only problem with them is a lot of them will grow gnarly. We have grown them even bigger. My Grandma used to grow some monsters! Well i would love some Seeds if they are heirloom. In am trade as well. Last week, I harvested a heart-shaped Pink Brandywine that was upwards of 1 1/2 pounds. I proudly presented it at a family get-together this weekend, then handed it over to my parents for their enjoyment! Help please does anyone know how big this type grow to. I found the seeds in a packet which I brought 6 years ago, and to my astonishment they have all grown, the thing is every single vine has and average of 15 tomatos on it, and although they are not ripening yet, they are still getting big, can anyone please help me with this. thank you.